A candy thermometer is a must for making this nostalgic confection. As with any candy-making project, a little patience goes a long way — the sweet rewards and smiles are worth the wait. 6 Skewers. Use wood skewers cut in half or twigs, cleaned and sharpened with a paring knife. Wash apples, remove stems and skewer. Attach a candy thermometer to the side of a heavy-bottomed sauce pan. Be sure the thermometer isn't touching the bottom or the side of the pan. Add honey, cream, butter, and Kosher salt. Heat pan on medium-high and whisk gently until mixture melds and begins to boil. While the caramel is heating prepare an ice bath in a large mixing bowl, have a small mixing bowl at the ready for dipping and prepare a flat surface with parchment paper to set the dipped apples to cool. Continue to boil as candy steadily increases in temperature and darkens in color. Whisk occasionally. Watch as the caramel approaches 260ºF (hard ball), then pour the caramel into small bowl and place the bowl in the ice bath. If the water gets into the caramel, the caramel will be ruined. Stir the caramel gently until cool and thick. When the caramel coats the back of the spoon, it is the right temperature to begin dipping the apples. Remove from ice bath. Dip the apples in the caramel, coating about 2/3s of the apple. 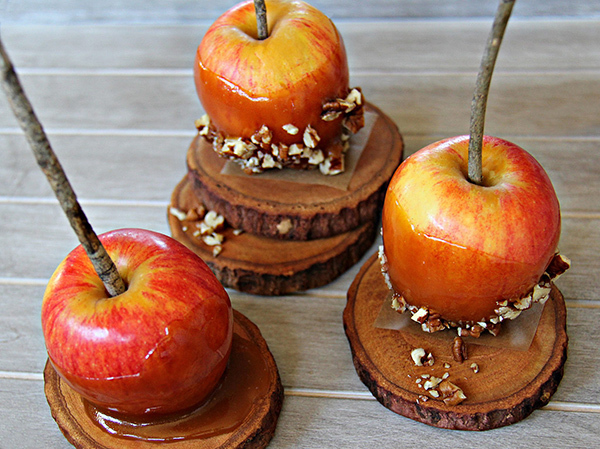 Roll the caramel apples in nuts and/or sprinkle with Fleur de Sel or Smoked Sea Salt. Rest on parchment paper to set before serving. Safety Note: Hot caramel will burn your skin. Pay close attention when pouring the caramel from the — it might be tempting but please do not dip your finger in it!